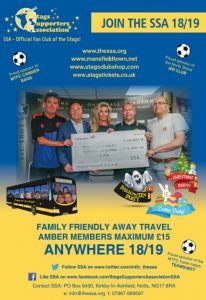 Official Supporters Club of Mansfield Town FC – . Welcome to the all new Stags Supporters Association website. Membership for season 2018/19 is now available on the SSA Membership page and you are able to pay online via our shop. You can download our new application simply by clicking the image on the right. Away travel details for our upcoming games will soon be available on site. Catch up with all the latest news from Mansfield Town FC on their official website here!